The cycling calendar is usually quite a fixed affair, with the same races appearing every season generally in the same familiar slot. But every four years a spanner gets thrown in the works in the form of the Olympic Games. 2016 is, of course, one of those years, and between August 6-10 this year the world’s best riders on the road will convene in Rio de Janeiro in the hope of adding an Olympic medal to their palmares, with the world’s best riders on the track taking centre stage between August 11-16. BMX (August 17-19) and mountain bike cross-country (August 20-21) complete the cycling events. The most comparable annual race on the road calendar to the Olympic road race is the World Championships. Both events feature a circuit-based road race and lengthy time-trial, and in both events riders compete for their nation rather than their trade team. Unlike the Worlds and most other races, where failure one year is at least compensated by the chance to try again in 12 months’ time, riders only get a few shots at winning an Olympic medal throughout their entire careers, and consequently the event attracts stellar fields. Greg Van Avermaet (Belgium) won the men’s road race from a three-man group, with Jakob Fuglsang (Denmark) claiming silver and Rafal Majka (Poland) bronze. Great Britain’s Geraint Thomas had been in a chasing group, but crashed on the final descent. Anna van der Breggen (Netherlands) won the women’s road race ahead of Emma Johansson (Sweden) and Elisa Longo Borghini (Italy). Great Britain’s Lizzie Armitstead was fifth. Both road race routes were tough and hilly. The riders tackled two circuits, the first featuring the narrow Grumari climb (1.2km with average gradient of 7 per cent and a peak of 13 per cent) and the dragging Grota Funda (which rarely strays from its 4.5 per cent average over its 2.1km distance). The toughest obstacle was saved for the second circuit, which featured a much longer climb (8.5km in total) in the form of the Vista Chinesa, with an average gradient of 5.7 per cent. Tackled once by the women and three times by the men, this is where the decisive moves were made. Kristin Armstrong (USA) endured tough weather conditions and a nose bleed to take gold in the women’s time trial ahead of Olga Zabelinskaya (Russia) and Anna van der Breggen (Netherlands). It’s Armstrong’s third Olympic TT title. Britain’s Emma Pooley finished in 14th place. Chris Froome took Britain’s first cycling medal of the 2016 Games in the men’s time trial, finishing behind winner Fabian Cancellara (Switzerland) and silver medallist Tom Dumoulin (Netherlands). Following the road events will be six days of track cycling held in the newly-built Rio Olympic Velodrome. Upholding the changes made in 2012, there will be ten events in total, five for the women and five for the men (see below). Great Britain has dominated at the previous couple of Olympics, winning seven velodrome golds in each, and look set to have another strong team capable of bringing home plenty of medals. The opening night on the track saw Great Britain take gold in the men’s team sprint, and qualify fastest for the men’s and women’s team pursuit – with the latter setting a new world record. 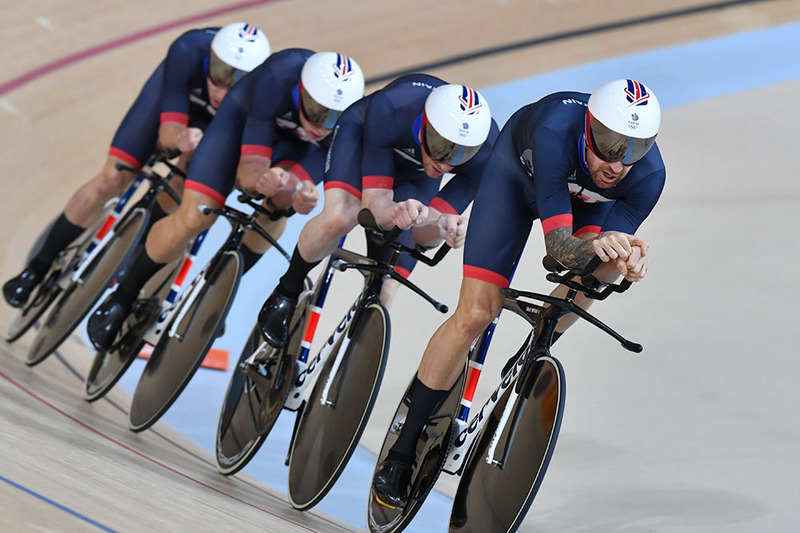 Bradley Wiggins, Steven Burke, Owain Doull and Ed Clancy set a new world record in the men’s team pursuit on Friday to take Britain’s second gold medal in the cycling events. China won the women’s team sprint. Some of the heroes of London 2012, including Chris Hoy and Victoria Pendleton, are now retired, but plenty of big names remain. Defending omnium champion Laura Trott returns with four more years’ experience under her belt (she was just 20 when she won gold in London), as does defending individual sprint champion Jason Kenny. Also returning to the track are two of British cycling’s biggest names – Mark Cavendish and Bradley Wiggins. Cavendish is targeting the omnium in attempt to finally land the Olympic gold medal he craves having missed out at both Beijing 2008 and London 2012. Wiggins successfully claimed his eighth medal (in the team pursuit) to become Britain’s most decorated Olympian. Team GB’s main rivals are likely to be the usual suspects in the shape of France and Australia. The French dominated the men’s events at the 2015 World Championships with Gregory Bauge and Francois Pervis claiming two golds each, while Australia starred in the women’s events with Annette Edmondson twice edging out British opposition to win a couple of golds and the evergreen Anna Meares adding one more to her huge career tally. Cycling Australia have set an ambitious medal target the 2020 Olympic Games in Tokyo, aiming to match Great Britain's gold haul from the Rio Games. Australian track sprinter Shane Perkins has thanked Vladimir Putin after being granted Russian citizenship as he targets the 2020 Tokyo Olympic Games. The velodrome used for at the Rio Olympic and Paralympic Games has received major damage after a fire swept through the building on Sunday. With lottery ticket sales falling, British Cycling could face a fall in its level of funding for the Tokyo Olympics, the first time its funding has fallen.